No real ale just fizzy piss. I waited several minutes before a barman appeared from a backroom whilst talking on his mobile. I seemed to be an inconvenience to him. I had an Amstel and it was expensive. Wouldn't bother with this place other than for the comedy shows held downstairs. 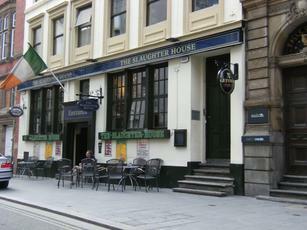 Irish pub in the financial area of Liverpool. Many pubs are closed around here at weekends. Whilst this one was open, there was only one person (playing a fruit machine) present when we arrived on Saturday afternoon. The guy at the fruit machine turned out to be the barman. No cask ales here. Just the usual keg suspects - Guinness, Guinness Extra Cold, Carling, Carling Extra Cold, Strongbow, Fosters, Caffreys, Becks Vier, Coors Light & John Smiths Extra Smooth. One other person arrived during our visit - she was a second menber of the bar team! Could do with a few more people. But maybe it is much busier in the evening. rude, foul-mouthed staff (have never heard the adjective "f***ing" so much behind the bar anywhere) and on a Tuesday night they were chasing out punters 10.30pm in a harrassing way with "last orders".. Ruined about 20 years ago. An absolute classic example of "just leave things alone". But they can't, can they? �3 for crap keg beer. If you have heard of this place, it is well known, but not been; dont bother. Went in here on Saturday night. It was a lovely warm evening and dozens of punters were drinking outside on the pavement. Not so many inside. Drinks selection was very disappointing. just Eurofizz, Guinness and Tetley keg. The place does have character though.